This is the biggest news of our day, Sept 29, 2015. While working on updates to our Barometer Handbook, we found that the 1963 Manual of Barometry (WBAN) has now been scanned and available as a free download. Apparently it was scanned the year following the publication of The Barometer Handbook. I would like to think that our promotion of this rare, amazing book contributed to this? WBAN is the Bible of mercury and aneroid barometers, as well as the basics of measuring barometric pressure... in fact, i wish there were a stronger way to put that description... maybe the Mother of all books on barometers... and altimetry. It is the monumental work of Louis P. Harrison, but other than a note in the Preface he does not often get credit for it as he was an employee when he wrote it and this was an official "US Weather Bureau" document, numbered WBAN. We have had an extremely rare printed copy for many years, without which our work on barometers in general would have been much more difficult, and probably not as thorough. It is not easy reading; most of the thousand or more pages are pretty technical... in some cases really specific (ie taking into account your latitude and the shape of the earth when computing the weight of mercury and your height above mean sea level), but if you have a question about how to use barometers for getting accurate pressure, then this is the primary source, and we list is as such in our own books. It also includes one of the first compilations of the fudge factors used to convert observed pressures at higher elevations to realistic sea level pressures, the need of which was first recognized by the American scientist William Ferrel in the1880s. He called this the plateau effect and these constants are still in use today. * Ferrel also discovered the Buys Ballot law (which was even acknowledged by Buys Ballot himself) and he was first to apply the concept of Coriolis force to the circulation of global air masses, and as it is generally used today, can be thought of as having invented that as well... though this has a bit more nuanced history. http://www.srh.noaa.gov/srh/dad/sfc/baroman.pdf Note added Jan 18, 2018. Abpve gone missing. Try replacement. What you do with accurate pressure once you get it is discussed in our books Modern Marine Weather and The Barometer Handbook. Note that the title page calls the book Volume 1, and the Preface refers to what was intended for Volume 2, but to our knowledge, there is no Volume 2 — when you finish this one, I am sure you will be dying for more, but I am afraid this is all there is. Note added June 1, 2018. I believe all that is here is still correct as it was in 2015 when this was published, and indeed special topics here may still be news to some readers, but there is even more new and exciting developments. We cover the new developments in our new Modern Marine Weather 3rd ed. Modern weather work underway relies on “grib data.” This is sailor’s jargon for surface analyses and various other forecasts presented in a gridded binary format called “grib.” These are vector data given for each point on a Lat-Lon grid. High resolution data can be as fine as 0.12º (7 nmi) between points, on up to 1.0º (60 nmi) between points. A grid spacing of 0.5º often meets ocean route planning needs, but now we have high resolution models (0.01º, 1.3 km) that are updated every hour that can be used on inland waters. Wind speed, wind direction, and sea level pressure are the primary datasets needed for planning, but also available and often useful include the height of the 500 mb surface and wind speed at that level, sea surface temperature, precipitation (rate and accumulated), wind gusts, and air temperature. There are also dozens of other atmospheric parameters that are available in this format that we do not often use at sea, but are likely to in the future, such as simulated weather radar for squall forecasting. Most of this grib data now in use are the direct computer output of numerical weather prediction models, the most popular of which is the US Global Forecast System (GFS). Thus we are looking at the same data the professionals use to make their official forecasts. The professional forecasters at the NWS, however, also look at models from other nations, some of which do better than the GFS in some cases. They also have more varied ways to look at the GFS data itself. Thus it is our obligation underway to check the grib data we use, i.e. GFS, with the final forecasts of the NWS. These two forecasts (GFS and NWS) will be very close more often than very different, but for crucial decisions, or for fine tuning routes as when racing, we must rely on the NWS forecasts, which brings us to one of the main points of this note. You can get the NDFD grib data with an email request to saildocs (saildocs.com), and now we are pleased to see this appear in commercial products like WeatherNet for PC from Ocens (ocens.com). They offer both standard and high resolution NDFD data in the traditional convenience of the WeatherNet interface. Resolution becomes a key factor underway when we are downloading by sat phone or HF radio. 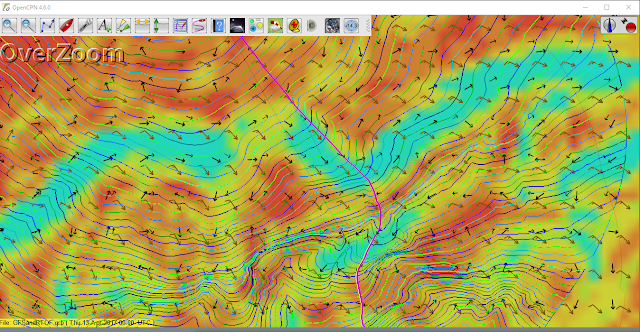 The high resolution of NDFD (0.12º) is not needed for open ocean sailing and it can make the files very large. The high res data are best reserved for forecasts near tropical systems or along coastal waters where you might want to detect diurnal changes in the wind closer to shore or within bays. The other exciting news from Ocens is they offer the ASCAT scatterometer data in grib format through their WeatherNet service. This wind data is not a forecast; it is the true wind speed and direction measured on the ocean surface as the ASCAT satellite passed over it—normalized to a height of 10m, the same as the GFS winds are. We only get this unique data about once a day for any one location, but it is a definitive evaluation of a forecast at the time, which we need in crucial decisions. It is not a surprise that Ocens would be the first to offer this ASCAT grib data as they were indeed the pioneer in this field. In collaboration with the NWS, they offered the first ever grib scatterometer data from the QuickSCAT instrument back when that scatterometer was working. Unfortunately, it stopped transmitting the type of wind data we need in 2009, which was rather before many mariners got to know the power of the data source. 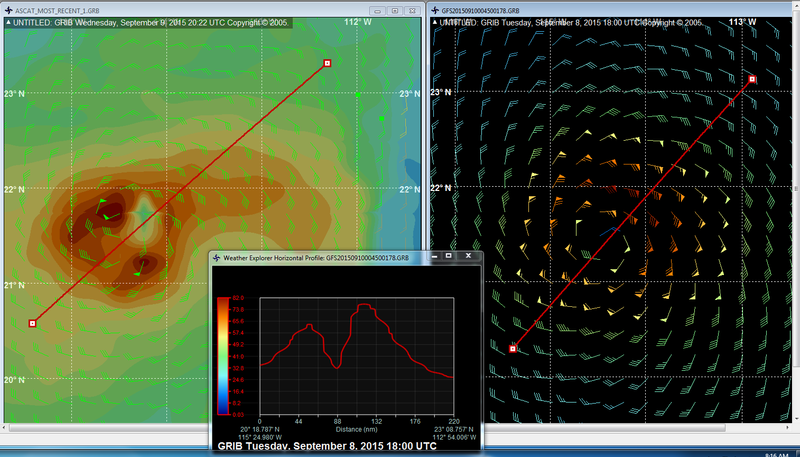 So scatterometer grib data is back, and we hope to see more of it. In the interim, the Indian Met office launched the OSCAT instrument, which provided very good data for a while, but it too has failed. Another new development in grib viewing is a low-cost, high-quality grib viewer and data source for Macs called LuckGrib (luckgribapp.blogspot.com). It was developed by Pacific NW sailor Craig McPheeters, created in large part while underway in the South Pacific. LuckGrib has an elegant design and convenient interface, with several unique features added to the standard functionality we expect from a high-quality weather tool. There is also an iOS version. For more background on the important role of grib viewing software and the acquisition of grib files underway in Mariner's Checklist Before Departure. There are many grib viewers for computers and tablets with as many different styles of data presentation and unique features, so I have focused here on viewers that can show NDFD grib data, regardless of where the data files were obtained. It is not uncommon to download a file from one source or viewer and then display it in another viewer. We hope to eventually see more sources offering the NDFD grib files, because these are likely to be the best global data available for the waters it covers. It will take a lot more study to decide if a regional model such as COAMPS or NAM might be better for near coastal waters in some cases. Discussions that favor these over GFS (an almost certainly a valid conclusion near shore) may not have made the same comparison with NDFD. Special features of several grib viewers are shown in the graphics below. Figure 1. Ocens Grib Explorer for PC showing ASCAT data on the left. Each of the individual wind arrows is tagged with the valid time of 1743z, Sept 8, 2015. This is a crucial step in the practical application of this data. Some viewers capable of showing the Ocens ASCAT grib files do not yet include this important time information. Each ASCAT file includes multiple satellite passes (data swaths) and these swaths have different valid times. On the right is the GFS forecast for 1800z for comparison. Also shown is their “route planner” tool that lets us draw a line between selected waypoints and view the wind and pressure at a specific time along that route. The tiled display is a unique feature of Grib Explorer for PC. Figure 2. LuckGrib for Mac has a “measure distance” tool that can be used for route planning. It can be marked in intervals, such as distance run in one day. 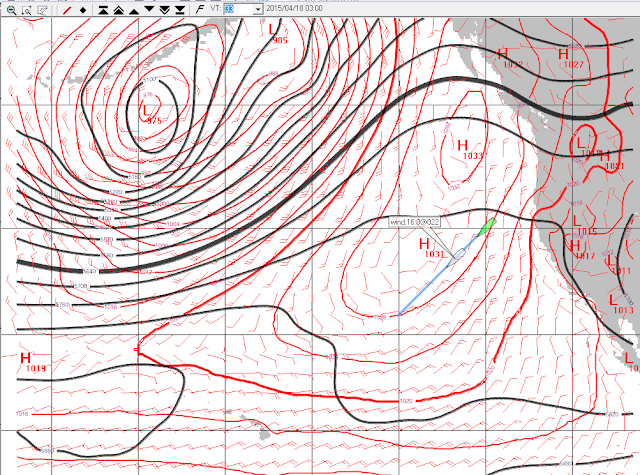 Then we can move the valid time slider back and forth to watch wind and pressure vary along the route. The high performance of LuckGrib makes this a smooth and informative demonstration of what we might expect. Then we can adjust the route and look again. 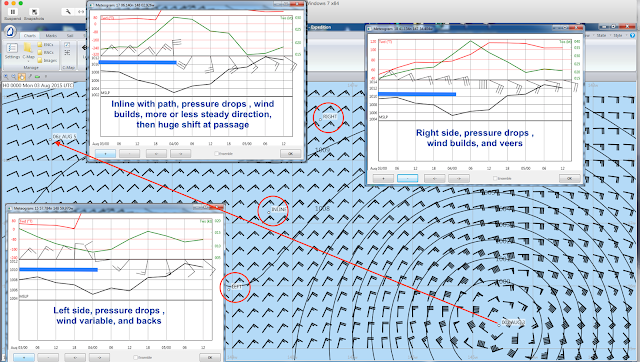 This is also a convenient way to study and forecast special diurnal winds such as the Coromuel off of La Paz. Figure 3. 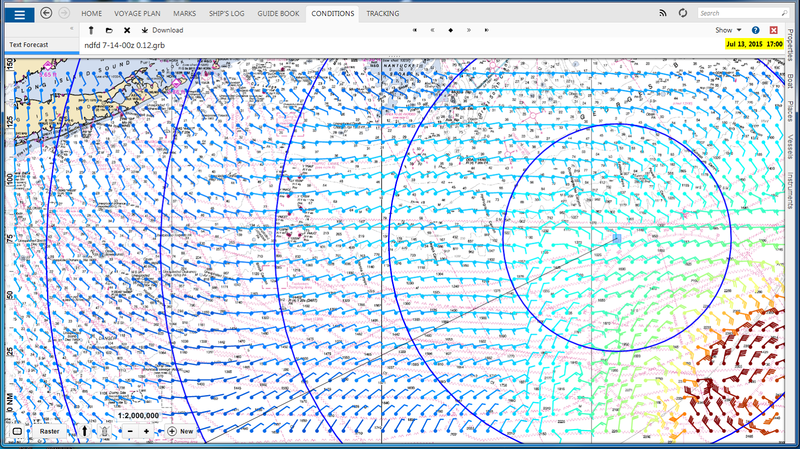 ViewFax from Saildocs is a popular grib viewer for PC with numerous special options. Its overall design is very basic, but it includes sophisticated features in a functional manner. It displays both ASCAT and NDFD data. It has a direct approach to route planning: you select the starting location of your vessel at the h00 time, along with the intended course and speed. 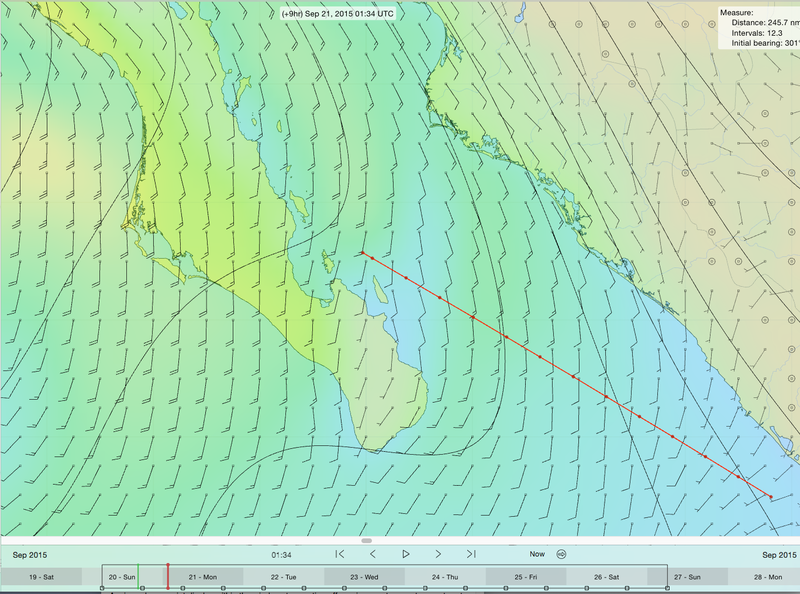 Then each time you advance the forecast time to the new map, the vessel moves to the corresponding location it would have at that time based on the entered speed and course and a pop-up shows the wind and pressure at the vessel. Also shown here is an over lay of the 500-mb surface heights, which offers a good way to evaluate the stability of the surface pattern and dependability of the forecast. 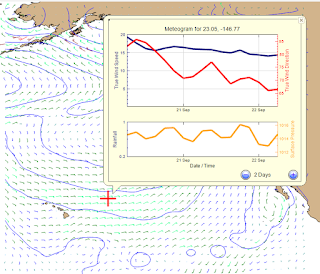 See Modern Marine Weather for details. Figure 4. Expedition from expeditionmarine.com is a premiere sailing performance and navigation program that includes sophisticated weather routing using grib files. It automatically finds the best sailing route to match your polar diagrams, taking into account not just the wind, but also ocean currents and sea state. You also have the option to scale or rotate the grib files to match actual observations. Though a long established product, we include it as it does show NDFD data and it has a newly enhanced meteogram feature for viewing wind and pressure over time at a specific point. The examples shown illustrate the different behavior of wind shifts on the two sides of a tropical storm. See an expanded discussion of this topic in an earlier post. Figure 5. 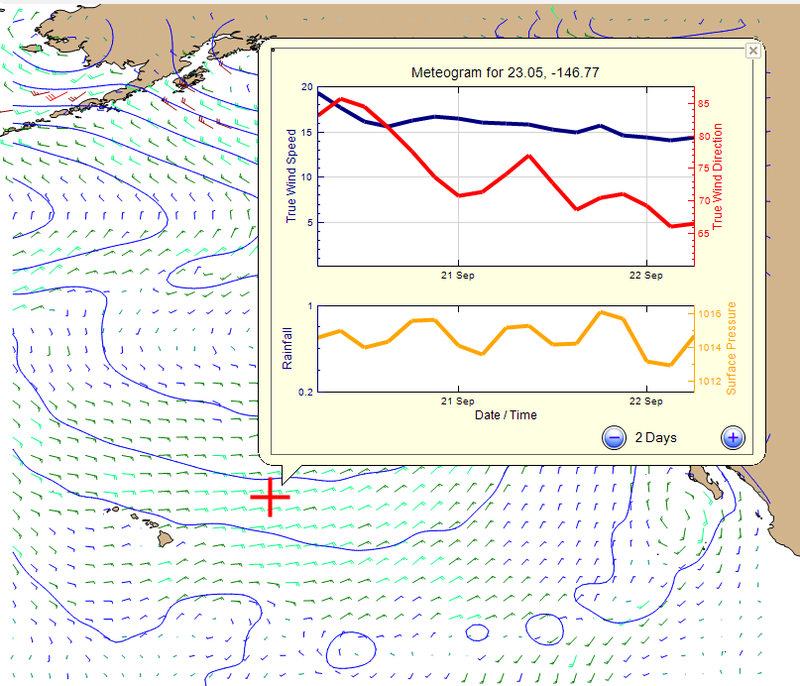 Coastal Explorer from rosepointnav.com is a popular echart program that also shows grib weather files obtained from other sources, and indeed it will display the NDFD data. Shown here is one easy way for a quick overview of weather conditions. We set multiple range rings on the h00 vessel position at 50-nmi intervals (6h run at 8.3 kts), then we can step the forecast forward with an estimate of where we would be at that time. 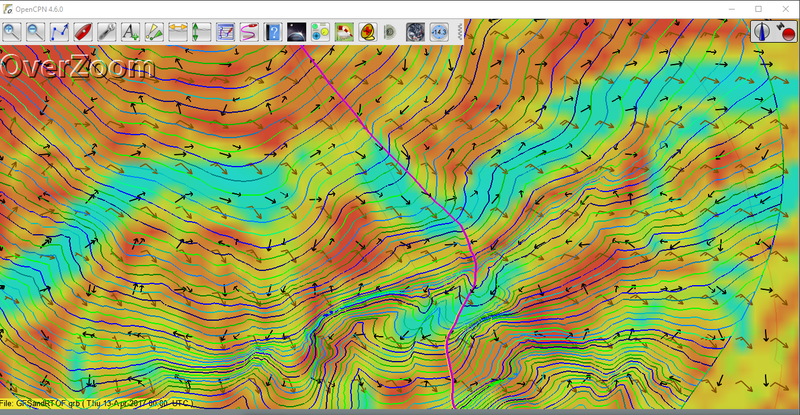 This program and the others illustrated here will also show ocean currents to help with route planning. The RTOFS or OSCAR ocean current data are readily available in grib format by email request underway. This open source program has a vast array of versatile plugins that make it just as valuable for weather work as general navigation. It also offers a convenient feature of allowing multiple files be opened at once. You can for example, open a standard GFS wind and pressure file together with an RTOFS ocean currents file. Figure 6. 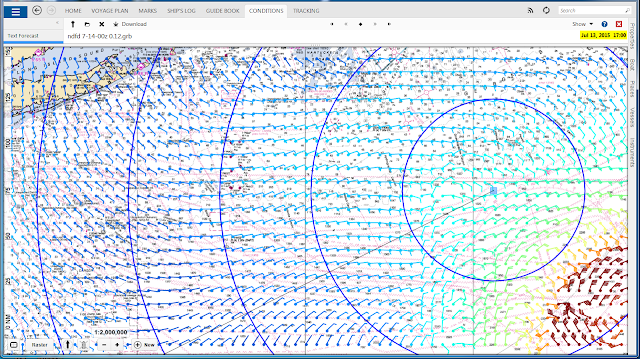 Here is an example of the OpenCPN weather routing plugin finding a good route through the Gulf Stream. The light blue-green is the strongest current.